Not all of our walking is going to be in beautiful countryside as evidenced by our most recent training walk. Starting at North Camp railway station just outside Aldershot we followed the Blackwater river some 12 miles north. 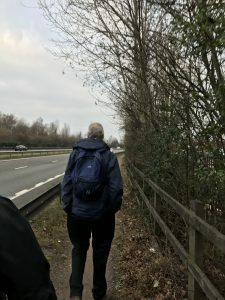 The first couple of miles were spent walking alongside the A331, a dual carriageway link road connecting the M3 with the A31. As you can imagine we got to see just how much litter is dumped at the side of busy main roads with plastic bottles and cans (mostly Stella Artois) being most evident. Thankfully, as the path edged away from the road we walked through some lovely water meadows and began to come across people walking dogs, enjoying the countryside, the road now a background hum. As the route we had planned was taking us into another town to enable us to get a train back to our start we were never far from buildings and so our walk then took us into a business park. As someone who has always worked in central London it was interesting to witness the manicured lawns, the putting green, the cafes and car parking in the carefully landscaped park. What a lovely place to go to work! 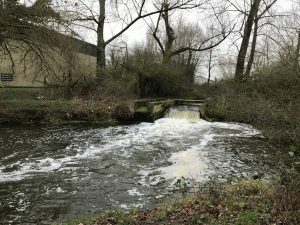 Sadly, we were soon thrown out and back onto the path by the river, this time opposite a sewerage works. Not much to see but good to note that the wildlife was thriving. Here, on the outskirts of Farnborough we followed and crossed a railway line, traversed an industrial estate and crossed a major road junction. Once we had got past the M3 the path began to follow more wooded areas with only the occasional road to cross. We also stumbled across a lovely café on the outskirts of Sandhurst – bacon sandwiches all round (rude not to). 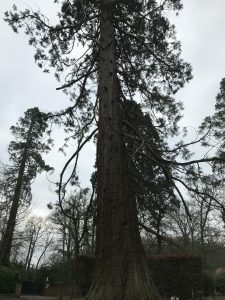 Just outside Crowthorne we came across a road lined with giant sequoia trees, cousins of the North American giant redwood trees which we thought was a nice touch of Americana to be found in the middle of Surrey. For those interested in history, the trees were planted as a memorial to the Duke of Wellington after his death. He had lived locally for most of his life (when he was not off campaigning). Our final trek into Wokingham was spent walking through a Forestry Commission wood and then a lovely stroll through open country side taking us to within 1 mile of Wokingham station. Sad to report again that the closer to the urban area we got the higher the volume of casually disposed rubbish. One of the charities that we are supporting, the Campaign to Protect Rural England, is passionate about our countryside and keeping rural areas clean and tidy so that they can be enjoyed by all. If only more could be done. We ended up walking 17 miles in 5.5 hours (including our bacon sandwich stop). A good training walk with four and a half months left to go. We are supporting five great charities. Please go to our Donate page to see how you can support us in our challenge.